Elton John has defended his expletive-laden rant at a "rude and disruptive" fan in Las Vegas. The 70-year-old was filmed storming off stage during his concert at The Colosseum at Caesars Palace on Thursday (March 1). Elton was performing his hit Saturday Night's Alright (For Fighting), when some lucky fans were invited up on stage with him - but he lost it when one overzealous fan kept touching his piano. Moments before the incident, he could be seen screaming “f**k off” repeatedly at one concertgoer, before suddenly leaving the stage. While his band carried on playing, Elton eventually returned to the stage, and the disgruntled star told the audience: "No more coming on stage during Saturday Night. You f**ked it up." Elton then continued his set with Circle of Life from The Lion King. In a statement released on Twitter, he explained that the man had been trying to sabotage his performance by hitting the piano and taking pictures. 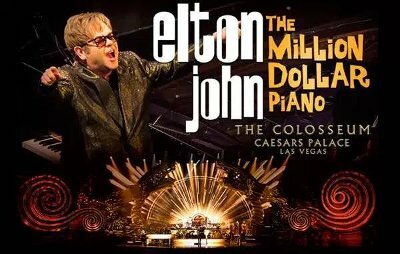 "On Thursday night in Las Vegas a fan put his hands on the piano keys while I was playing and continued to do so even after I asked him to stop," Elton stated. "He then proceeded to reach over the piano and try to take pictures, completely disrupting the performance. I bring fans onstage every evening when we play 'Saturday Night' in the set, it is always a lovely part of the show where I get to meet them, shake their hands and have them right there with me while I play.